Police have identified the driver of Thursday evening's chase as 26 year-old Antoine Dunlap of California City. Dunlap lead officers on a chase through Cal City late Thursday evening when he nearly collided with a patrol car near the Cal City McDonald's parking lot. Police chased Dunlap in his green 2000 Honda Accord through Village Parkway and around RPU school. Dunlap and a female passenger jumped out of the car and fled on foot. The car continued to roll backwards as it was left in "Reverse" and was left driverless in the street. Officers attempted to stop the car on foot as it was stuck driving circles in the street. The car's path slowly grew as it traveled uncontrollably in a larger circle and soon was passing closer and closer to an adjacent home. The officers were able to use their patrol unit to stop the car before the out of control car could crash into the home. Police K-9 "Tello" located a female passenger in a nearby yard but was unable to locate Dunlap. Dunlap is 5 feet 8 inches tall, weighs 170 lbs and frequents homes on Fernwood and Dogbane Ave. 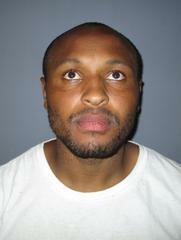 He has prior arrests for burglary, robbery, drugs and is currently on Parole for Kidnapping. Anyone with information on his whereabouts is asked to call Police.